When the long-missing Vic Kruger’s Oldsmobile is wenched up out of Grey Lake, those of us fully immersed in Melinda Leigh’s “Morgan Dane” series knew that at last, the question of what happened to Lance Kruger’s father would be answered. For 23 years, Lance wondered what caused his father to disappear out of his life. That disappearance forced the 10-year old Lance to grew up too quickly as he watched his mentally-fragile mother crash and burn. Former Detective now Private Investigator Lincoln Sharp was haunted by the case as well. Not only was it his case, but he had a front row seat to the fallout for young Lance and Jenny Kruger. Now Sharp watches the car slowly appear out of the Lake’s murky depths, fearing yet relieved that closure is at hand. But this discovery only creates more questions, ripping open old wounds for Lance and Jenny. More terrifying is that it is disturbing someone who is determined that the answer to that long-cold case remains forever submerged. Wow, just wow, wow, wow! I am not sure I can write a review that does this book justice! The writing, that pace, the plot – just sheer perfection. Lance Kruger went through hell the moment his father disappeared; his glimpse of heaven was his developing relationship with Morgan and her beautiful daughters. Now with the mystery of his father’s disappearance is back, front and center in Scarlet Falls and the surrounding County, Lance is doubting his memories of his father and his worthiness as Morgan’s beau. And although the spotlight is not shining brightly on Morgan, she is very much part of the story, supporting Lance,battling a new obnoxious and possibly dangerous foe in a new ADA and balancing her family with work. But when the chips are down – move over Eve and Roarke, Sam and Nick – Lance and Morgan are our new romantic suspense power couple! As for the resolution of the mystery – not only was it satisfying, but I am one of the many readers that “did not see that coming!” The whole “whodunnit” was complex yet simple, if that makes any sense. There are mysteries where you sense where the story is going and who may be revealed as the villain. But here, I really had no clue until Lance and Morgan came to the realization just who was behind it all – I felt their shock to my core! And towards the end, when Lance looks up and sees Morgan “like Wonder Woman?” Yes, Lance, indeed she is…. Now, as an aside, I usually shy away from series that have the same Hero/heroine in each book. I always find myself losing interest as the writer has to come up with new scenarios between the couple to develop drama. But so far Ms. Leigh has done a stellar job of realistically developing Morgan and Lance’s relationship! I have full faith that this author will continue to make this series fresh and exciting. Fortunately, there are a couple of Dane siblings “wandering” out there just waiting for their stories to be told. And as for Lincoln Sharp? Now there’s a character deserving of a book and HEA! In the news today, there are many families with children who have “gone missing” and adults who have disappeared without any apparent reason. 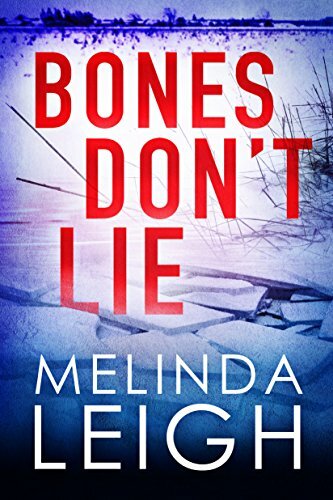 Bones Don’t Lie is the story of a young woman who went missing but apparently was not missed very much, and a man, with a wife and a 10-year old son, who went out for a few groceries and never returned home. The loss of these individuals occurred 20-years earlier. The man’s disappearance caused his wife to be mentally ill with only her son to care for her. This book elicits a full range of emotions. It is heart-rending in many places. It is Melinda Leigh at her best. Melinda Leigh is very good when it comes to weaving a thriller of a tale. Keep up the good work, Melinda. However, if each book continues to get better and better, I don’t know how you will be able to continue the standard you have set for yourself. This Morgan Dane series is a must read for me. Book 3 is as interesting and intense and twisting a plot as the first two books. After 23 years, PI Lance Kruger’s father’s car is found — but no father. However, there is the body of a female in the trunk. With his PI partner Sharp and his lawyer/girlfriend Morgan, the three furiously pursue leads to find the woman’s killer and, hopefully, what happened to Lance’s dad. Fast action, well-defined characters (even Morgan’s three little girls) and a couple of not-so-nice secondary characters push the plot along as I scramble to keep up with all the activity and theorizing. As a bonus for me, the Lance/Morgan relationship continues apace (yes!) but with no needless tangent to act like lust-filled teenagers messing with the plot. BTW, it is not necessary to read the first two novels, but you will be happy if you do.